This week's Photo Of The Week is a "real photo postcard" with a very poignant message. In 1907 Kodak created a service called “real photo postcards,” enabling people to make a postcard from any picture they took. Postage at this time was a penny. This postcard is postally used and indicates that 1907 is the latest possible date for the image. A one cent stamp has been used. The photo on this postcard is round and measures 2 1/2" in diameter. Circular images 2 1/2" in diameter were produced by Original and #1 Kodak cameras starting in 1888. In 1907 Edna Aldrich was a thirteen year old girl living with her mother Mary and stepfather Fred Mason in Missoula, Montana. Also living with Edna is her brother Clyde who is listed as a farmer and his second wife Pearl. Edna's father, whom she is writing, is O.M. Aldrich. O.M. Aldrich is living in a lodging house run by Goodson Beech on Market Street in Denver, Colorado, in 1907. O.M. 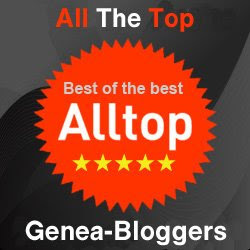 is Oscar M. Aldrich and he is an engineer. Edna had been living with her mother and brother in Frenchtown, Montana, since she was seven years old. The 1900 census lists Mary as married, but the O.M. Aldrich Edna has written to as "papa" is not living with them. Mary lives with her married son Clyde, his wife Bertha, and Mary's daughter Edna. Mary lists no employment and Clyde works as a day laborer. Many day laborers are listed in Frenchtown and they worked in three primary areas, the sawmill, placer mining and farming. 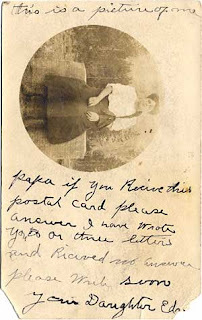 Edna has mailed her postcard to her father on what appears to be August 1907 from DeBorgia, Montana. 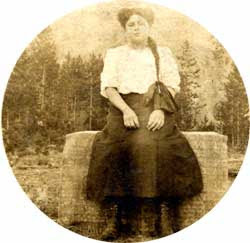 DeBorgia sits on the banks of the Regis River and originated as a station on the Northern Pacific twenty miles from Lookout Pass, which divides Montana and Idaho. The name is derived from the St. Regis de Borgia River. DeBorgia is very close to Frenchtown, Montana where Edna is listed as living. 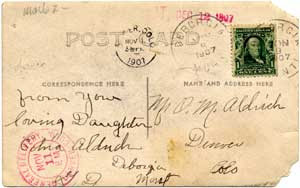 The postcard arrives in Denver on 1 November, 1907 at 3:00 p.m. and is released for General Delivery on November 11, 1907. Oscar apparently does not call for his mail and the postcard is returned to Montana on December 11, 1907. I purchased the card in an antique store in Wallace, Idaho. Wallace is a scenic town very close to DeBorgia, Montana. It is sad that in today's world I am able to find Edna's "papa" for her in Denver, Colorado. I am just 101 years too late. We can only hope that Edna and her "papa" found each other before it was too late, or before Edna thought she had been forgotten. 1910 U.S. census, Missoula County, Montana, population schedule, Missoula, p. 265, dwelling 339, family 366, Fred Mason (Head); digital images. Heritage Quest (http://persi.heritagequestonline.com/ : retrieved 28 April 2008); citing NARA microfilm publication T624, roll 834. 1900 U.S. census, Missoula County, Montana, population schedule, Frenchtown, p. 53, dwelling 77, family 77, Mary Aldrich (Head); digital images. Heritage Quest (http://persi.heritagequestonline.com/ : retrieved 28 April 2008); citing NARA microfilm publication T623, roll 913. What a sad (and fascinating) story, fM...Makes one want to know the rest of the story. I had wondered about postcards with personal photos on them - I have several of my paternal grandfather, and never knew how he had managed to afford what I had thought was an unusual process. Thank you for the education (as always)!